When I first became a mom, I knew things wouldn’t be smooth sailing all the time, but I was not prepared for little things – like figuring out how to get kids to take medicine – to be so incredibly difficult. Aren’t kids supposed to love the artificial taste of medicine? I certainly did when I was a child, but when it comes to getting any kind of medication into my daughter, the struggle is real. Of course, it wasn’t always this way. When she was a baby, I could easily get pain meds down her throat to alleviate the misery of teething, but once she hit the 2-year mark and decided she needed to have an opinion about everything, medicating her became nothing short of hellish. For 2 years, I relied on suppositories. Most pharmacies sell OTC pain medications in suppository form, and I was able to find a compounding pharmacy that could take pretty much anything our pediatrician prescribed and make suppositories out of it. This meant I usually had to wait 12-24 hours for the pharmacist to physically make my child’s medicine, which isn’t ideal when your little one is sick and suffering, but with no other alternative, I did what I needed to do. But when my daughter hit the 4-year mark, started full day school, and needed antibiotics more frequently, her doctor wasn’t willing to play the suppository game anymore. He felt she was old enough that I should be able to reason with her and politely wished me his best as he handed over a prescription for oral antibiotics and sent me on my way. I have memories of sitting with my sweet girl in the kitchen that night with a dose of bubble gum antibiotics in one hand and a bucket in my other, and I watched in horror as she gagged and gagged and gagged. After 45 minutes, I gave up, even though I’d only gotten about half the dose into her. I spent the greater part of that week driving to and from our local pharmacy trying various different flavors and textures and dosing options, and each time I called her doctor to express how much trouble I was having, he refused to budge. I had to figure out a way, he said. In the end, I found something that works. It’s not ideal and it still causes a lot of drama and crying and screaming by both my daughter and me, but I no longer feel the same sort of dread when faced with an antibiotic prescription. When my daughter was in the ER with a badly sprained ankle on Valentine’s day when she was 2, a nurse taught me a trick to get kids to take medicine that has worked with a lot of my friends’ children. Her strategy was to have me hold my daughter so she was looking at me, squeeze her cheeks gently so her mouth would open, squeeze a syringe full of medicine into her cheek (never the back of her throat), and then blow into her face so she is forced to swallow. Sadly, my daughter is a real fighter and spit the liquid out before I could blow in her face every single time I tried this, but if your kids are younger, it’s worth a shot. If you’re lucky enough to have a kid who can be bribed with things like chocolate pudding, coca cola, jello, chocolate sauce, strawberry milk, etc., whip up a batch of his favorite treat, slip the medicine inside, sit back, and relish in the fact that your son thinks you’re the best parent in the world for letting him have a chocolate milkshake 3 times a day. If your kids like to play pretend, a fun thing you can try is concocting a little ‘toy medicine’ (also known as ‘water’) and then lining up her favorite toys on the kitchen counter so everyone gets a turn to take their meds. It can be a fun game with older kids and can help alleviate some of the anxiety that comes along with being sick as it’ll make them feel less alone. You can allow them to do all of the dosing themselves to give them an extra sense of control. I still cannot comprehend how this would EVER work, but one of my girlfriends SWEARS by this strategy. She simply drops a small amount of medication into her daughter’s mouth while she’s peacefully sleeping (she spaces it out over the course of 5 minutes or so to ensure she doesn’t choke), and while her daughter sometimes wakes up, it usually doesn’t happen until most of the medicine has gone down her throat anyway, making it a non-issue. And since it’s fairly easy to get her back to sleep, it’s a win-win for everyone. If you have a sound sleeper, it might be worth a try? If your child is older and makes a fuss whenever it’s time to take his medicine, why not give the control to him? I realize it might be messy letting him fill a medicine dropper or pour thick, sticky, bright red liquid onto a spoon, but if the added sense of control helps lessen his anxiety, it’s worth a little extra mess! I never wanted to be the kind of mother who bribes her child to do things, but desperate times call for desperate measures, and I am not above using bribery as a strategy to get meds into my kid. I always find the first dose of medication is the worse – the anticipation of the whole process gets my little one very worked up – so I usually offer a small treat in advance for a little extra motivation, and I always offer a bigger reward for when the entire course of antibiotics is complete to give us something to look forward to. Some moms might find this ridiculous, but I don’t care. I find it gives us something to strive towards, and each time we knock another dose off our medication calendar, it gives my daughter (and me!) a sense of pride that we’ve gotten one step closer to our goal. When my daughter cracked her head open and had to get stitches when she was 2, I was worried the doctors were going to have to sedate her because she kept flailing her arms and legs whenever they tried to get within 5 feet of her. But then a nurse handed me a blanket and asked me to swaddle her, and while it was heartbreaking to hold her down like that, the stitches were in before I could count to 100. Now, I am NOT a fan of this method as I think it’s cruel, but if your little one has a scary high fever at 3 am and refuses to let you get anything in her mouth, give the swaddle method a try. The idea is to keep her arms and legs tight to her body so she cannot fight you, but please do this as gently as you can. I’ve already mentioned that this was my only option for getting meds into my daughter when she was under the age of 4, but in case you’re scanning this post, I wanted to include this in my list. I never even knew this was an option before becoming a mom, but most pharmacies sell OTC pain medications in suppository format, and if you can find a compounding pharmacy near your home, you can ask your doctor to write a prescription for whatever medication your child needs to be made in suppository form. Just be aware that only compounding pharmacies can make suppositories, and it can take 24 hours for them to make and set the medication, so act fast! The issue I have with getting medication into my daughter has nothing to do with the texture. It’s the taste. She doesn’t like sweet things, nor does she like berry ANYTHING, and since all children’s medication tends to have a sweet, berry-like taste, it automatically triggers my daughter’s gag reflex. Get medication made it capsule format, open the capsule and empty it into a bowl, and mix it with her favorite treat. Now, I’ve already mentioned my daughter doesn’t like sweet things – including chocolate – which still makes this a challenge. She is also a very picky eater and doesn’t eat a lot of foods that lend themselves to being mixed with medicine, so my options were pretty much nonexistent. But then I remembered that she likes St Dalfour’s wild blueberry jam (it’s literally the ONLY jam she likes) and decided to give it a go. But over time we’ve perfected the process and even though she does it kicking and screaming, it does work. First and foremost, I try not to talk about it. While some kids like as much warning as possible about something they don’t want to do, I find it causes my daughter more anxiety. So when it comes time to medicate my daughter, I get everything ready while she’s busy doing something else. I mix her meds with a tablespoon of blueberry jam, grab a clean water bottle with a straw and a bag of whatever mini cookies my daughter is currently crushing on, and when I call her into the kitchen and break the news that it’s time to down her meds, I ask her to chose 3 of her toys to help us. Once she’s made it clear she doesn’t want to take her medication – and I’ve reminded her it’s not negotiable – she goes and finds 3 toys to help us, and we assign each of them a number. We each predict which one of her toys will be the best at taking medicine, and then, with each spoonful she takes, we pretend she turns into one of her toys and take notes on how well they did. The actual medicating part is a bit of a process. I try to divide it into 3 spoonfuls so I’m not giving too much medication at once but I’m also not prolonging the agony, and each time my daughter takes a mouthful, she immediately swallows it down with a huge sip of water and chases it with a mini cookie. We then breathe in and out together to ensure she stays calm and doesn’t gag, and once I feel she’s ready, we start again. But it gets the medicine down, and that’s all that matters to me. Deborah Mailman once said, ‘Motherhood is wonderful, but it’s also hard work. It’s the logistics more than anything. You discover you have reserves of energy you didn’t know you had,’ and when I’m dealing with something that seems beyond my capabilities, I often think of this quote. If you’re at home with a sick child who refuses to take medication and you’re starting to feel desperate, remember to breathe. You will eventually figure out a way. But one day, you will figure it out. In the meantime, give some of my suggestions a try, and if you absolutely cannot get meds into your kid, give your pediatrician a call and ask if he or one of his nurses would be willing to show you their trick to get kids to take medicine. You might discover the secret we’ve all been waiting for. 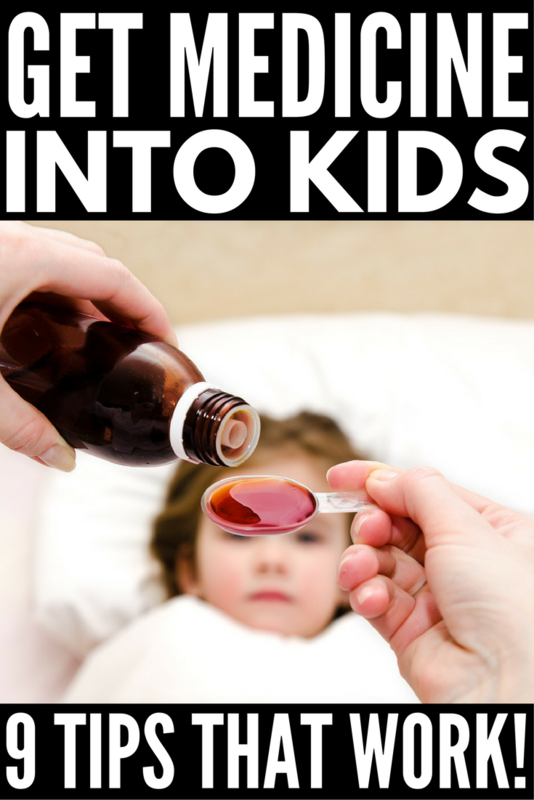 If you found my tips to get kids to take medicine helpful, please share them on Pinterest!